There has been so much interest in this stunning little book. It is available through Kalahari.net for only R121,51 or Exclusives Books for R135.The ISBN number is 9781862058101. 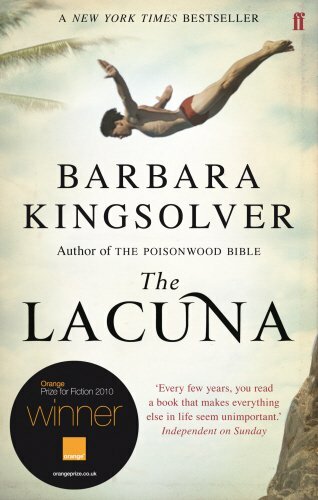 Get yourself a copy – even if you seldom use it, it makes a lovely addition to the kitchen shelf. 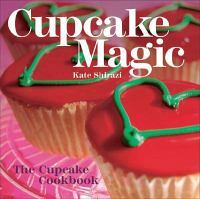 I have discovered that Kate Shirazi has also published Chocolate Magic and Baking Magic. I think I will need to visit the book shop very soon! This is the smartest movie I have seen in a long time. 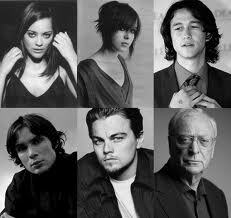 Inception is built on layer upon layer of narrative, setting and characterisation. Just when you think you have it all figured out, there’s another layer. It’s like Russian dolls that way: as soon as you think you’ve gotten to the smallest doll, you discover the crack that reveals another one. The story follows Cobb (Leonardo di Caprio) and his team (including Joseph Gordon- Levitt) as they plan a subconscious burglary – they steal ideas through the subconscious mind. This sounds tricky, and it is for the team and the audience. First you have to suspend disbelief and allow the premise that people can in fact enter dreams. But the dreams are so brilliant, so real, that the film sweeps you up and the difficulty in telling dreams from reality makes the film. This may be a film about a heist but it is not way simply a hi-tech robbery film of The Italian Job and Ocean’s 11, but the story also looks at far more intriguing themes like forgiveness, acceptance and guilt. Ellen Page plays the grounded confidante to Di Caprio’s troubled mind and she is the character that ultimately drives the story forward in revealing what has happened or will happen. 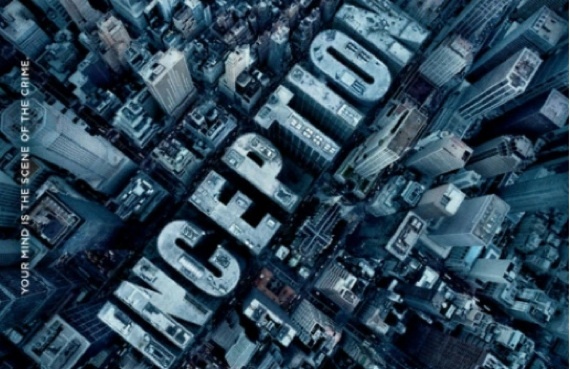 Layers are integral to Inception, and the way they interlink is something I’ve never before seen. Some may compare it to The Matrix, but this goes far beyond those simple levels to a far more complex and meaningful story. Leonardo di Caprio has, with Shutter Island and The Departed, shot to that echelon of stardom that few reach and his performance in Inception is laudable. He plays it cool, yet accesses some really deep emotions without heading for melodramatic territory. He is going to be one of The Greats and Inception will surely be one of the films that will appear in Classic Di Caprio DVD sets in the future. Go see Inception on the big screen, as the visual effects by Chris Ourbould are stunning and the big screen will allow you to become totally immersed in the reality/fantasy of the film. It is worth going to see Inception for the cinematography alone.Christopher Nolan is a brilliant director and this is even better than The Dark Knight. And the ending… It is mind boggling. Please, see this film! Have I mentioned I’m obsessed with cupcakes? Tho se delicious little bite sizes of heaven which have glorious potential for flavour and decoration and all round yumminess? I haven’t? Well, this is where it went from mild interest to full blown obsession – Cupcake Magic. Kate Shirazi has created a stunning book dedicated to mixing, baking and decorating my favourite delicacy. The best part about this book is how the chapters are divided – “Low Faff”, “Mid Faff” and “High Faff”! From this I could immediately tell that this was going to be my kind of book. If you have ever baked cupcakes (which I highly recommend trying, even if you think you can’t bake) then you will know that the decoration depends completely on time at hand and the mood you are in. 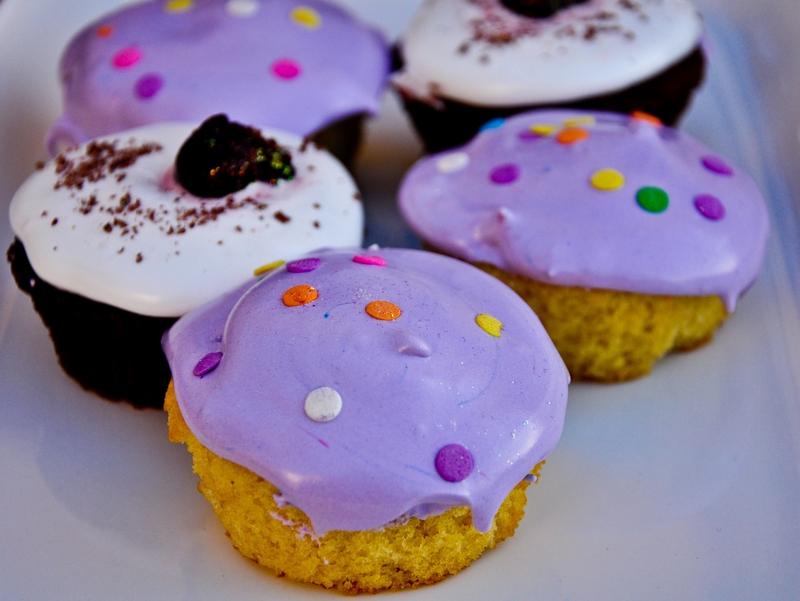 Cupcake Magic caters perfectly to finding the perfect cupcake for both these criteria. When I have time my personal favourite is the “Black Forest Gateau Cupcake” (pictured below), but for quickies, I opt for the “Basic No-Mucking Around Cupcake” which is true to its name and can just be sprinkled with icing sugar – mmmmm… good. (Mine are pictured with purple royal icing). 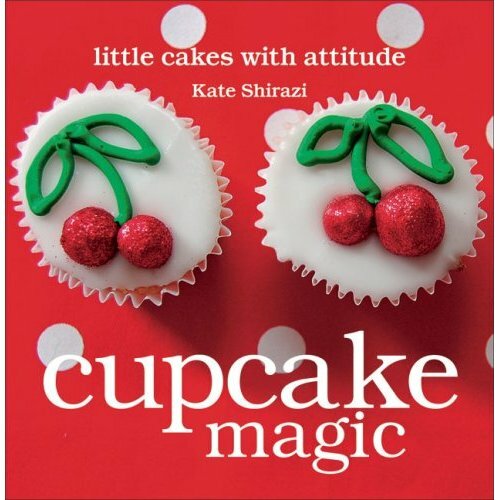 Kate Shirazi has devised easy, light and fluffy recipes which all bake in 20 minutes. Her icing recipes are so useful and she also includes how to make decorations for the more adventurous (I have only got as far as roses!). 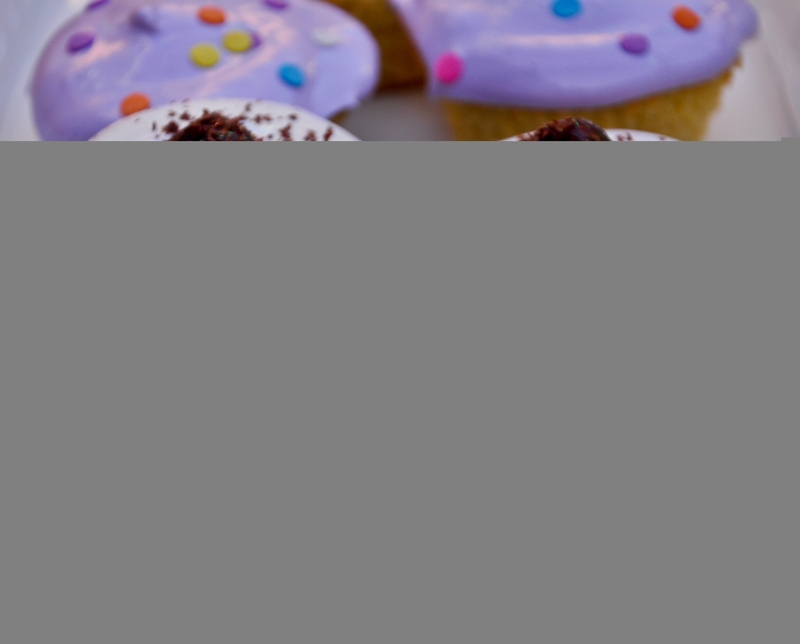 Her style is informal and she will guide you every step of the way to perfect cupcakes, including tips on ingredients, baking supplies and decorations (I love edible glitter!). Something interesting about the recipes is that they all call for margarine. Most bakers frown on this, but Shirazi bravely takes a stand and admits that for cupcakes, and only cupcakes, she prefers margarine because it makes for fluffier batter. She has quickly won me over with edible proof. Plus, who couldn’t trust someone who saves battery chickens and only uses free range eggs? (She did actually save battery chickens and now has her own egg supply at home). I highly recommend this book for any aspiring baker or someone who simply loves cake. Plus the photographs and layout are so gorgeous that this book would give anyone’s kitchen shelves a lift. Thank you to Sarah Duff for photographing my creations (yes, I actually made these ones!). 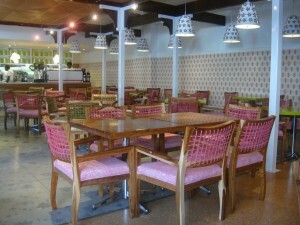 Please check out her stunning blog at www.veggiedelish.com (it really is delish). Pre-heat oven to 170˚C. Line muffin pan with cupcake cases (this will make washing up and getting the cupcakes out easier). Sift the flour, cocoa powder and sugar into a large bowl, or food processor. Add marg, baking powder and eggs. Beat well until batter is light and fluffy. Spoon mixture into the cupcake cases and bake for about 20 minutes until firm to the touch. Remove and allow to cool. 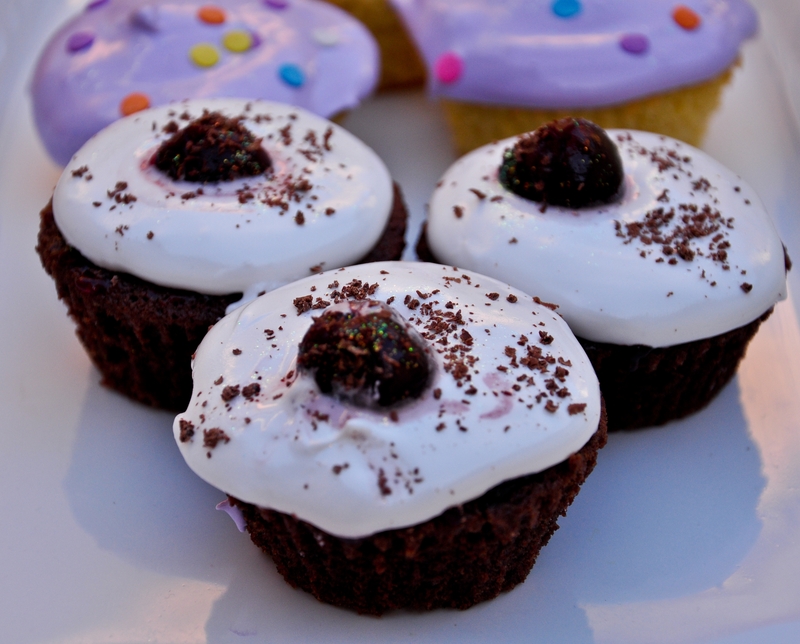 Once cool, smother the top of each cupcake with a generous amount of jam, then pile whipped cream on top. Finish with some grated chocolate. I then finish them off with black cherries, but Kate Shirazi suggests glace cherries on a stick.